I am happy to be back here again. The household routine has been a bit askew the last while which, despite my best intentions, has kept me from sitting down or even thinking too much about sitting down to write a post. The last month and a half have brought plenty of good things – a birthday (including a surprise party and an evening of food and music which I may eventually write about), a visit from family, a school vacation, a much-needed break for this weary mama, an evening or two (or three) filled with friends, food and wine, a new beginning in a pop-up shop, a child starting pre-school and a (dare I say it) spring breeze whispering of change and possibilities. Putting these things into words, it now dawns on me that there are plenty of good and perfectly valid reasons why I have been away from this space and oft absent from my studio. Though I have missed both spaces, I must confess that I am most grateful for all the events that have been keeping me from them! Enough about all that! I thought it might be fun to give you a little glimpse behind the scenes. 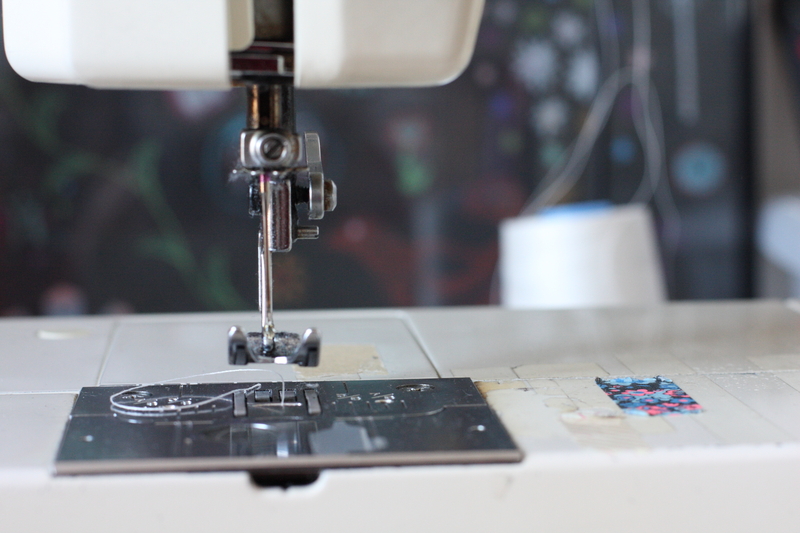 Given that I always find it quite interesting to see how the lovely crafty people on the blogosphere make their creations, I thought I might share a little bit about my sewing machines. I use two different ones, which I daresay are both (vintage) manual machines and have both been given to me. I love both and use them frequently, though I do sometimes catch myself drooling over the fancy digital machines I sometimes see in tutorials. 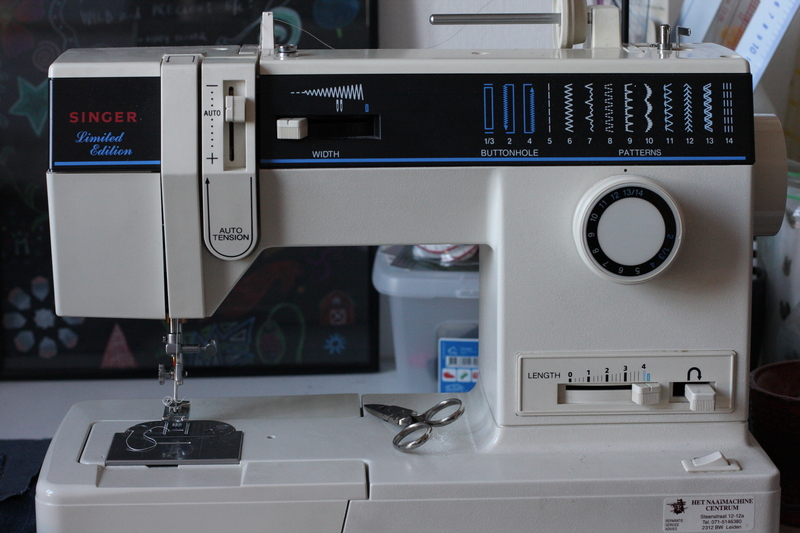 The first machine is a Singer 7033, which was very generously given to me by my neighbor’s sweet mother a few years ago. She bought it pre-loved herself and was looking to provide it a new home – lucky me! I can only imagine all the lovely things which have been made with it by its previous owners before it landed in my studio. I have since added a few presser feet to my collection and am extremely happy with this machine, which handles denim like a trooper and, armed with a walking foot, quilts up a storm. Both of these things have supplemented my older machine wonderfully (though admittedly, I use it for all kinds of other sewing, too, much to my delight). 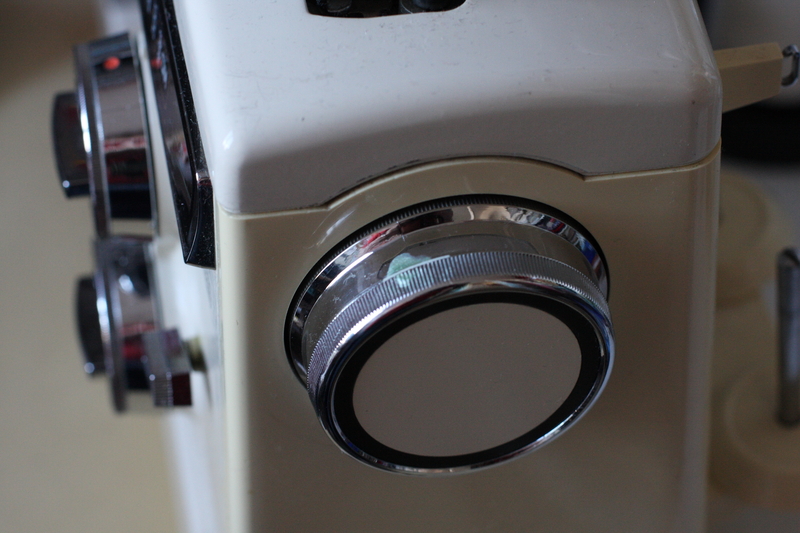 The other machine I use is a very well-traveled and well-loved Kenmore Convertible Model 1785. 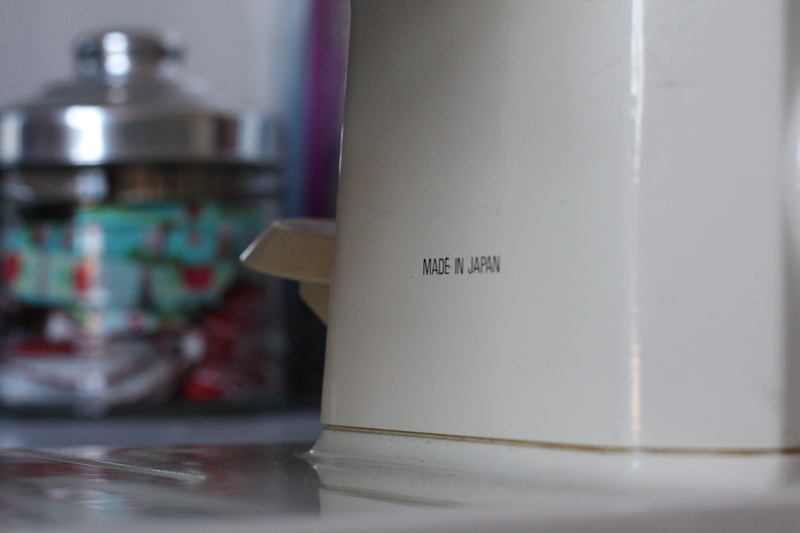 This machine has immense sentimental value to me. 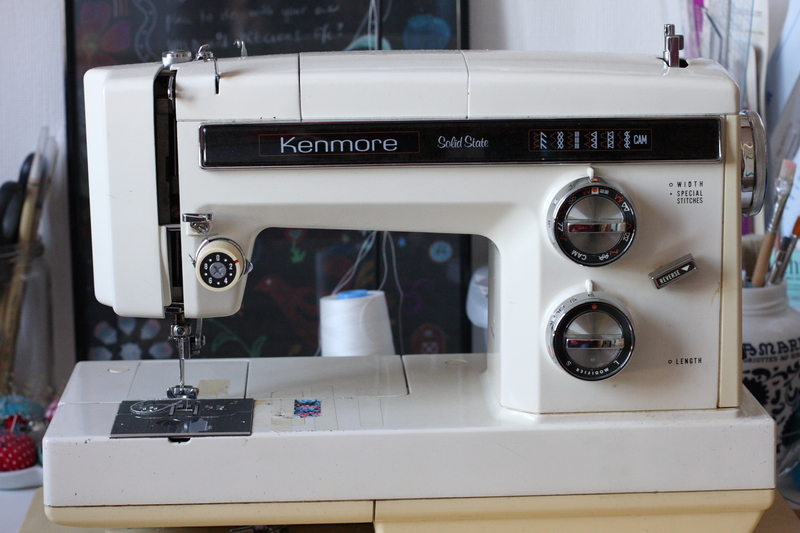 It was the machine that I learned to sew with. According to the inside cover of the manual, my mother bought it back in Oct or Nov 1981, though I think that can’t be right given the story they tell of the shopping trip. She and my father drove to Sears (about a half an hour drive) on their motorcycle (yes, you read that right) and picked out this sturdy machine as my mother’s first new machine. They bought it and drove with it, my mother holding onto it to balance it on the back rack of the motorcycle, those 30-odd minutes to our house. I feel a special kinship to it because I, too, spent many a weekend afternoon in the summer on the back of that motorcycle while we went out just to drive around. Some tape and washi tape which serve as seam guides for some of my projects. When my grandmother passed, my mother inherited her machine, passing this one to me. At the time, I was already living in Amsterdam, but I was determined to bring the machine back with me. The €12 mini machine I had bought at the Blokker had served me well enough, but I was ready for more serious sewing adventures! The transportation of the machine itself was a challenge as the domestic leg of my flight is flown in a tiny little propeller airplane. A machine this size wouldn’t fit in the overhead (nor did I feel comfortable putting such a large and heavy object up there in all honesty), but it also wouldn’t fit under the seat. It’s not large, so I was allowed to carry it on, but in the end, I needed help from the flight attendant to stow it. I explained to her quickly what it was and that I had inherited it from my mother upon my grandmother’s passing. Either I wasn’t clear (which was possible as I was emotional at the passing of Grandma) or she didn’t hear me properly, but she seemed to think that the machine had belonged to Grandma and jokingly referred to it as such. I appreciated (and needed to hear) her humor and so played along, and in the end, we ended up putting “Grandma” behind the back seat of the plane, tucked away neatly and safely. A little ring that has been taped on the case since I brought it home. No idea what it’s for, but seems like it belongs there now, so I haven’t removed it. On occasion, I think back to that trip and how I worried and fretted about how it would work out, bringing a machine overseas, uncertain if customs duties would need to be paid or how I would find an adapter and transformer in order to be able to use it at all, all the while pondering where I’d ever find the space to store it in my tiny Amsterdam flat, and then I smile, thinking of “Grandma” and how I am now – many quilts, skirts, aprons, curtains, shirts and years later – quite certain that she had meant for it to work out all along! 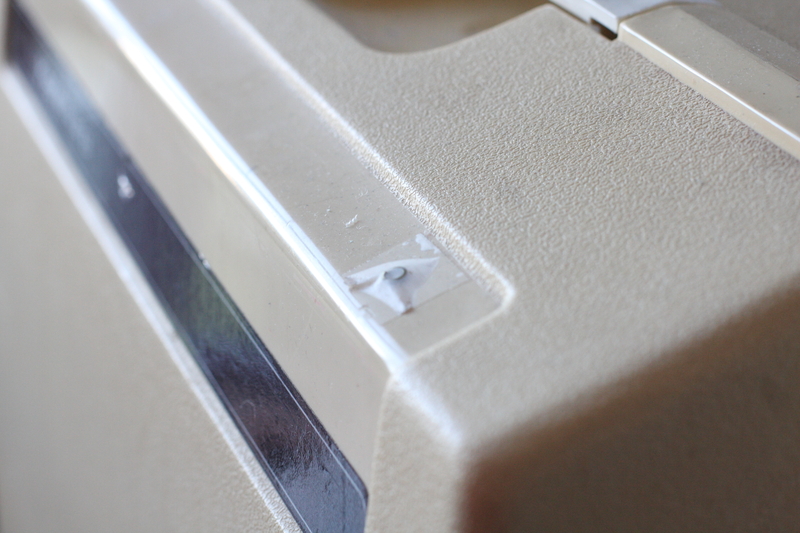 The little dot of nail polish on the fly wheel is to cover the spot where the metal is flaking off. It took me a while to figure out why I had small cuts on my finger, but once I did, I put a thick dab of nail polish on it to seal the stop and protect my hand!